This is part two of an 8 part (may end up being 9) series on OSHA’s new Recommended Practices for Safety and Health Program. Last week we wrote an introduction to the new recommended practices. I may have failed to mention that this is the first real revision of the elements of a safety program that OSHA produced since 1989. Long time coming don’t you think? The full website dedicated to this new initiative is found on OSHA’s site. The direct LINK IS www.osha.gov/shpguidelines The manual is easy to read and much of what we’re doing in this series comes straight from their manual. Text copied from OSHA is in italics. OSHA used to call the Management Commitment to Safety. The goal is the same. Without a solid commitment to safety from the top it is difficult to have others WANT to work safely. If management takes short-cuts the supervisors will take short cuts and the line employees will take short cuts. A clear, written policy helps you communicate that safety and health is a primary organizational value –as important as productivity, profitability, product or service quality, and customer satisfaction. This sounds fairly straight forward BUT it doesn’t get carried out nearly as well as it could. The very first thing you should do on this one is to write a formal policy expressing the company’s commitment to safety. This should be signed by all the top management and/or ownership of the company. But this is just a piece of paper you say??? Yes it is a piece of paper but it should be a piece of paper that is given to every employee, board member, contractor etc that has ANY impact on the activities of your employees or condition of your plant. You may want to hang it on the poster board, on your desk or wherever you and your supervisors would see it. It might not even hurt to get your supervisors to sign their own version and put it where they are reminded of their commitment. This ‘piece of paper’ needs also to be backed up by actions. You must do what you have committed to or you may as well not bother. This means looking for unsafe work practices whenever you are in the plant, it also means complementing people when they are doing the right thing. If you have an opportunity (board meeting, staff meeting) take just a second to mention safety and that it is on your mind. By establishing specific goals and objectives, management sets expectations for managers, supervisors, and workers and for the program overall. The goals and objectives should focus on specific actions that will improve workplace safety and health. While the first action item is pretty clear and can have a significant effect, it doesn’t take a lot of time and resources…it’s a mindset change. This Action Item can take some time to develop and measure. You should think about safety at your facility and figure out how to set some goals and measure those goals. This isn’t easy and certainly isn’t the same at every plant. For some, it may mean taking these guidelines and measuring the accomplishments of every one of the action items. For others it may mean weekly inspections of the physical facility by an outside party to determine the condition of the plant. Whatever you choose, you need to measure it periodically to see improvement over time. OSHA also recommends that the goals be something that is proactive and not reactive like injury and illness rates. I really can’t comment on this more than to say that the a safety program with no time or financial resources is pretty worthless. Implementing safety at any facility takes time and money. Initially it seems like that’s all you’re doing but eventually those resource demands taper off as the culture changes. Identify a front line person or persons to lead the safety program effort, make plans, coordinate activities, and track progress. Define and regularly communicate responsibilities and authorities for implementing and maintaining the program and hold people accountable for performance. Establish ways for management and all workers to communicate freely and often about safety and health issues without fear of retaliation. This means that SOMEONE needs to be responsible for for safety. That person or people must also have the authority and backing of management to carry out whatever responsibilities they are saddled with. Responsibility and delegation of that responsibility is fine but responsibility without authority is a no-win situation. Keep it positive. 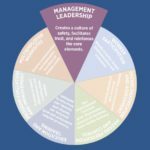 The foundation of a successful safety and health program is the leadership of management. Safety is an attitude/culture. This is the goal of our round tables each year. Think about safety constantly and it will translate down to the people below them. Same is true with the ownership and management. Expecting safe work and working safely yourself will translate down to everyone else below. Leadership on safety is what everything else is based on. Work on this first. It doesn’t take a lot of money but it may be the hardest part of the whole thing. It needs to be solid for the rest of the elements to work properly. Next week we’ll look at Worker Participation in Part Three.